Robyn Oyeniyi is an Australian IT professional and CPA who spent many Sunday mornings writing her memoir detailing a traumatic battle against the government to be reunited with her husband and step-children. The Oyeniyi family – my family - almost disintegrated before it even began. 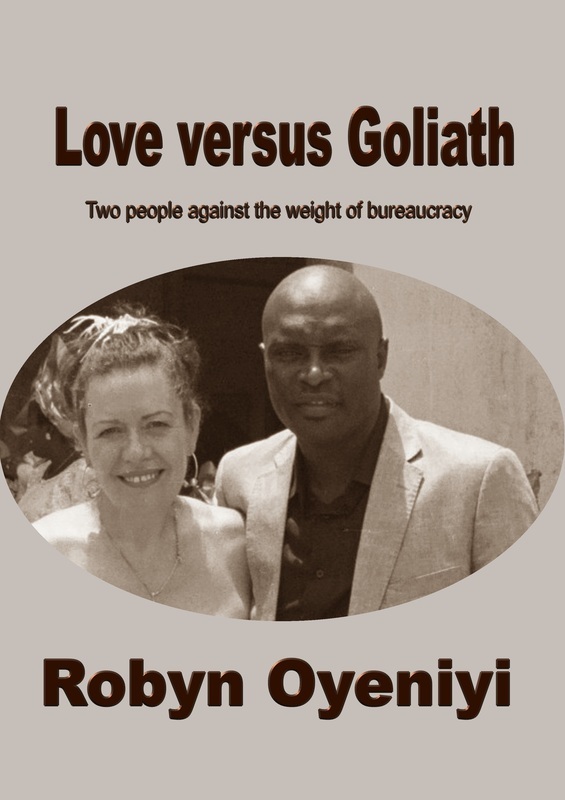 LOVE VERSUS GOLIATH chronicles my battle against bureaucracy, antiquated laws, and a pair of governments whose regulations and oversights threatened to separate me forever from the husband and children I love. When I was 15, my parents committed suicide six months apart. Their deaths, and the ensuing government oversights, left me afraid that bureaucracy would always let me down. Forty years later, in January 2010, I met John, an asylum seeker from Nigeria who was then being held in mandatory detention in Australia. He had fled his homeland after being beaten almost to death – and almost shot - during a period of political turmoil. John fled Nigeria and travelled through Tanzania, Zimbabwe, India, Bangladesh and China before reaching Australia in 2008. He was initially housed with a murderer while awaiting a decision on his claim for a Protection Visa, a situation that filled John with fear. After meeting John, I tried to help him obtain a Protection Visa, which had so far been denied at every turn, working my way through mountains of confusing, disorganized paperwork. To my horror, I discovered the government had put John on a “removal pathway,” preparing to send him back to Nigeria and the community where he almost lost his life. Australia removed John in April, 2010. The following month I flew to Nigeria, where we married. I spent only a few short days in Nigeria. On the flight home I became very ill, and even had to discard a pair of underpants in a bin at Lagos Airport because I couldn’t find any running water to clean them. Upon my return to Australia, I worked with our lawyer to finalize a Partner (Spouse) Visa application for John. We submitted the documents in June, and while I waited for it to be processed I lived in fear that I might never see my husband or my step-children again. John had gone into hiding from the people who wanted him dead. The children were cared for by relatives and friends. I watched Nigerian news reports in a constant state of terror, every day expecting to hear that my husband was murdered. Throughout the process, I was horrified by my government’s lack of compassion. My family was in danger but it seemed that no one cared. It seemed that unless I sewed my lips together like a protesting asylum seeker, or ended up in hospital myself, no one would even listen to my family’s story. I felt much the way I had shortly after my mother’s suicide – invisible, unimportant, and ignored. Finally the visa decision came. Denial. My government was essentially telling me I must either leave Australia or get a divorce! I could appeal, but the waiting period meant I possibly would get no hearing for at least two years. I couldn’t keep John safe, or risk his survival, that long. The battle to be reunited with my family is a question of law. It was also a question of people's lives.